At this time of year, we look anxiously for the beginning of spring, especially those of us who live in cold areas, where April is merely the month when all the snow finally disappears. We might take a walk around our neighborhoods and see plants in bloom, but when we come back through the gate our own gardens can be sadly lacking. If that sounds like you, then some inspiration is needed, so here are some ideas for plants you can use to get the season off to a flying start. A key method to getting the best garden is to systematically choose plants for different seasons, not just the ones that catch your eye at some moment. It is easy to ‘do’ late spring and early summer – that time has the greatest number of plants blooming, and we are all enthusiastic to get into our gardens. The garden centers are packed with plants, but they choose mostly those in flower at the time, because they sell best. If we do the annual shopping spree, and stop there, then we will inevitably end up with a garden that is wildly colorful in May and June, and plain green the rest of the time. A much better approach is to stand back a little, and deliberately look for plants that bloom very early, as well as ones for summer and fall. Do that, and you will always have something interesting and colorful going on in your garden – adding to the pleasure and enjoyment you get from your private space. So here are some shrubs that bloom early in spring – in March or April mostly, depending on where you live. These are roughly in order, with the very earliest first. There are two redbud trees – the Western Redbud, Cercis occidentalis, and the Eastern Redbud, Cercis canadensis. Both look very much the same, but the Western Redbud grows best in drier, warmer places, and the eastern one grows best in cooler, damper areas. The flowering of these small trees is nothing short of spectacular, and they bloom very early, usually while the rest of the trees are still bare. Their brilliant purple-pink flowers glow in the spring sunshine, and really turn heads. For the rest of the year they have attractive, heart-shaped leaves, and in winter the graceful, twisted branches bring beauty too. In colder areas especially, this plant is well-known for heralding the spring. Before anything else has begun to grow, the clusters of buds along the bare stems of Forsythia are swelling and bursting, pushing bright-yellow blossoms out until the whole bush glows with gold. It will grow well in partial shade, and in any kind of soil, so this is also an effortless way to start the season with a bang. If you live in zone 4, choose the Lynwood Gold Forsythia, as this is the hardiest. With some others, the flower buds can be killed in the winter months. The plants themselves still grow well, but you rarely see blooms, which can be confusing. Stick to a reliable, cold-hardy variety like Lynwood Gold, and you will never be disappointed by non-flowering Forsythia. 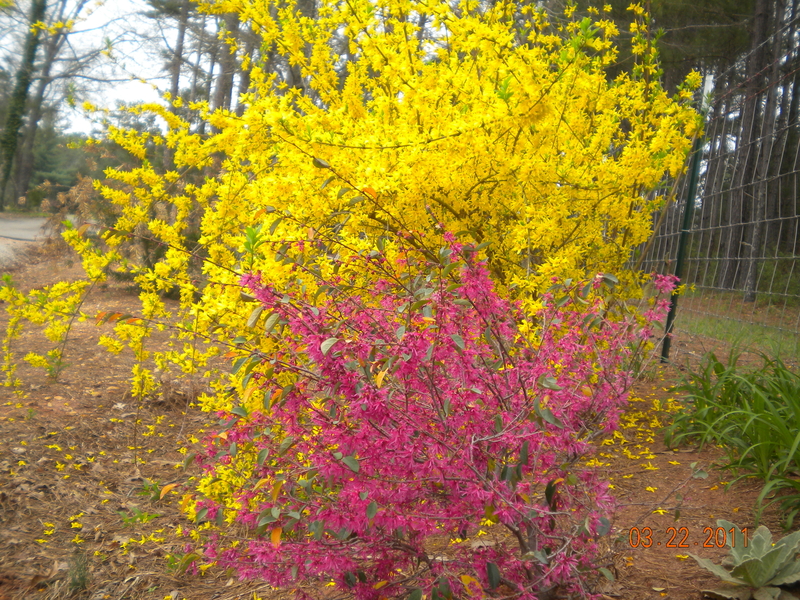 If you are in zone 5 or warmer, your choices are greater, and the Show Off Forsythia is an especially good pick. Unlike other varieties, that can grow very large, this one never grows above 6 feet tall, and it is always covered in bloom from top to bottom. If you become too impatient by February or March for a taste of spring, venture out into the garden and cut a few branches from your Forsythia. Indoors, in a vase of water, they will quickly open their flowers and give you a brilliant taste of what is to come. This tree, Amelanchier, is another super-early bloomer. On this upright, vase-shaped shrub or small tree, trusses of white blooms will quickly come out as soon as the coldest weather is over. They glow in the spring light, and set against the smooth, pale-gray bark, they are a vision in white. Later the berries themselves will develop, and these make excellent pies and jams. This is a real two-for-one plant that should be in every northern garden. Close behind these early harbingers of spring are the magnolia blossoms. There are two kinds of magnolia, the southern evergreen one and the deciduous ones. While the southerners wait for summer, the others are so eager to go that the blooms come out before the leaves, smothering the branches of these wonderful trees in huge, cup-shaped blooms in pink, white and purple, often with several shades on a single flower. Depending on where you live, your trees will start to bloom in February, March, April or early May, but they will always be among the earliest flowers in your garden – and among the most spectacular too. There are many to choose from, but northern gardeners will be very interested in the ‘Girl Series’, developed at the National Arboretum specifically to flower well even in zone 4. They all have girl’s name, and ‘Jane’, ‘Betty’ and ‘Randy’ all bloom in shades of pink, with the Randy Magnolia the most purple, while the Betty Magnolia is more reddish. Magnolias are surprisingly fast growing, and they soon make good-sized small trees, so allow enough room for them to develop. Ones planted on the south-side of your house will bloom about a week earlier than ones in the open garden, and the leaves will shade your windows in summer, which is always a good thing. Whatever early blooming trees and shrubs you choose – and maybe you will plant them all – remember to keep them regularly watered during the first season or two. Mulching with some rich organic material in spring will conserve moisture and also feed the plants, knowing they will look more and more beautiful as each spring arrives again.